1, 2. 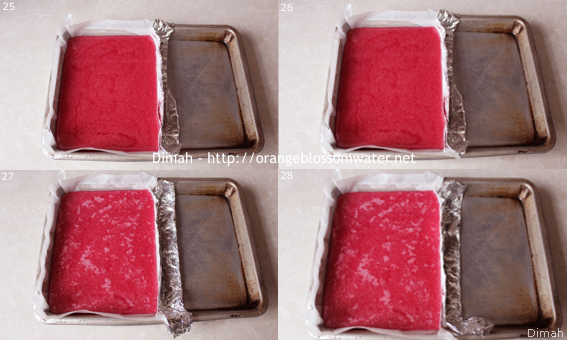 Use aluminum baking sheet with sloped sides, the size of the sheet is 7.9 x 11.8 inch (20 x 30 cm) (base measurement). Line half of the baking sheet with parchment paper as in picture 2, and set aside. 3. In a saucepan, put sugar. 4. 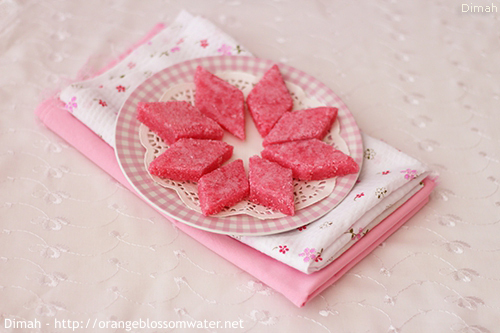 Add water to sugar. 5, 6. 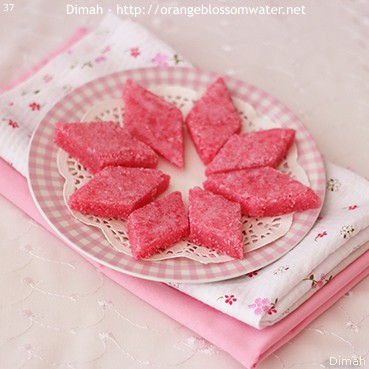 Dissolve sugar in water over low heat without boiling. 7. 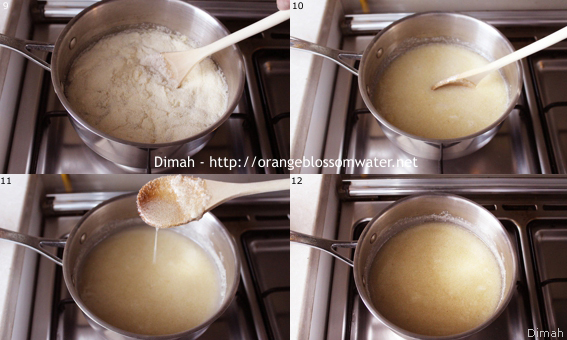 Once sugar dissolved, add ghee to the syrup and stir gently. 8, 9, 10, 11, 12. 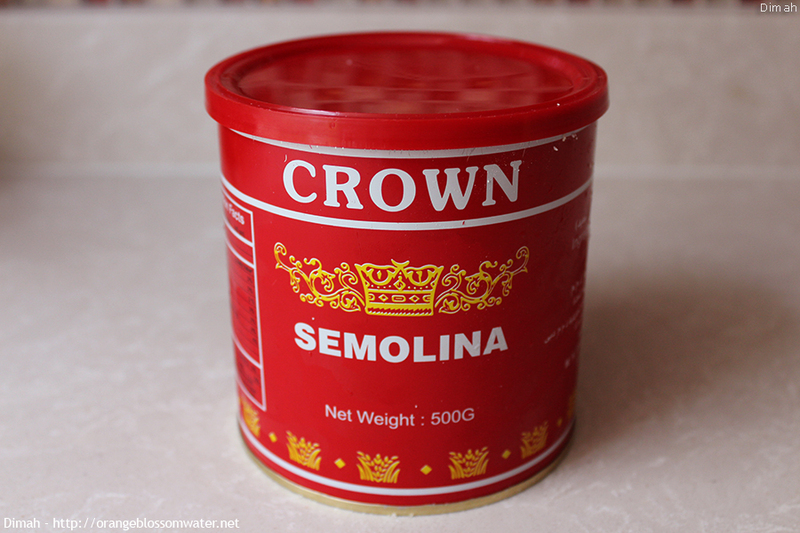 Add semolina flour (smid farkha), and keep over low heat with frequently stirring. 13, 14, 15. 40 minutes after adding semolina flour, add the food coloring, and keep the mixture over low heat with frequently stirring. 16. 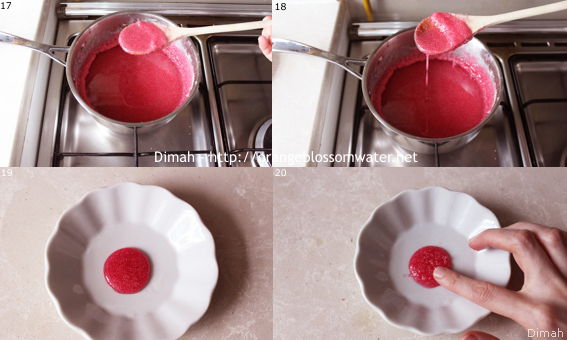 15 minutes after adding the food coloring, add the rose water, and keep the mixture over low heat with frequently stirring. 17, 18. The mixture should be kept over low heat all the time with frequently stirring. The tricky part is to know when the mixture is ready, the semolina flour should be cooked and the mixture will slightly thicken but still runny. 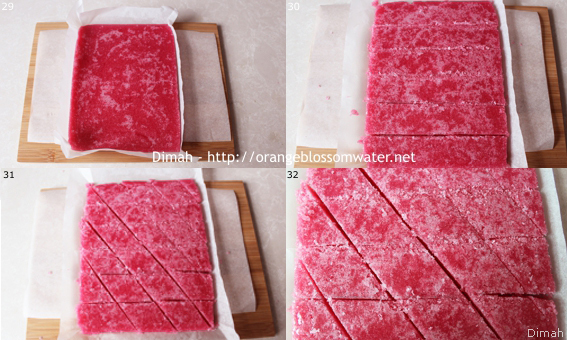 The whole process of cooking Mahia took 100 minutes (from start “step 1” to finish “step 18”). 19, 20. To test if Mahia is ready, drop a spoonful of the mixture onto a plate then wait, it will firm when cools and it shouldn’t stick to your fingers when you touch it. 21, 22, 23, 24. 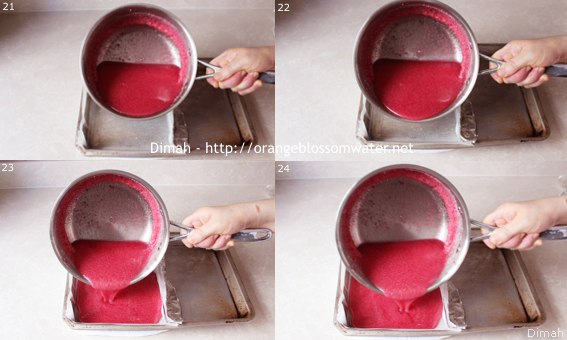 Pour the mixture to the prepared baking sheet. 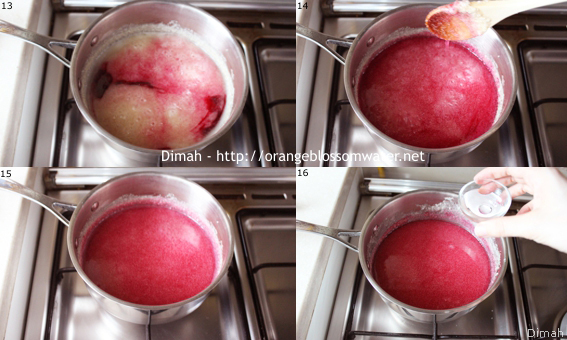 Do not pour the extra mixture which remains on sides of the saucepan. 25, 26. Allow the mixture to sit for 15 minutes to firm up. 27, 28. 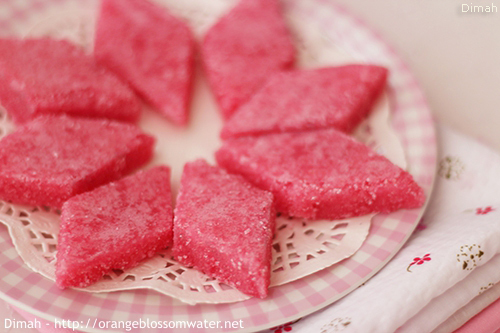 When the mixture sits you will notice that the surface has sugar crystals, this is normal. 29, 30. Immediately after 15 minutes, transfer into a cutting board. 31, 32, 33, 34, 35, 36. 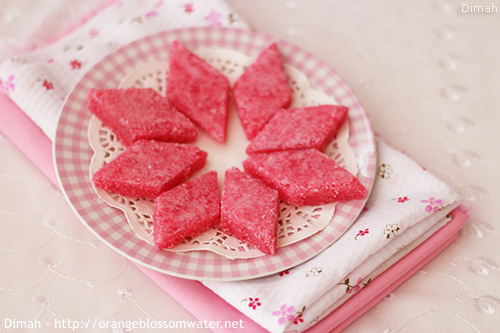 Cut into diamonds, then gently with your hand dust off excess sugar crystals. 37. Store at room temperature for days. If you want to store it for long time so keep it in the refrigerator, but take out of the refrigerator and allow to sit at room temperature before serving. 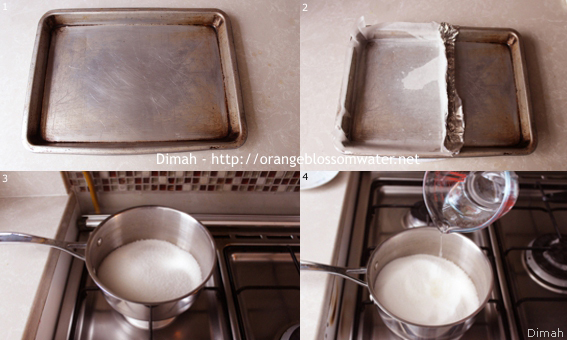 2 tsp rose water Use aluminum baking sheet with sloped sides, the size of the sheet is 7.9 x 11.8 inch (20 x 30 cm) (base measurement). Line half of the baking sheet with parchment paper as in picture 2, and set aside. In a saucepan, put sugar. 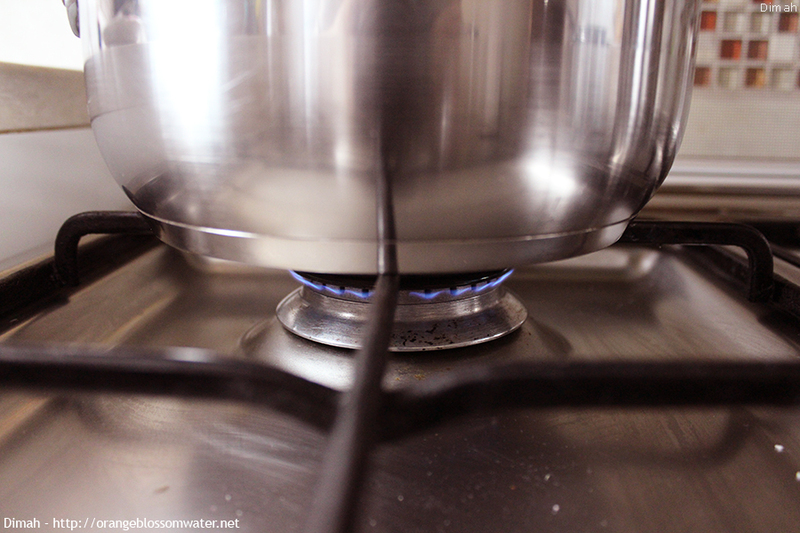 Dissolve sugar in water over low heat without boiling. Once sugar dissolved, add ghee to the syrup and stir gently. 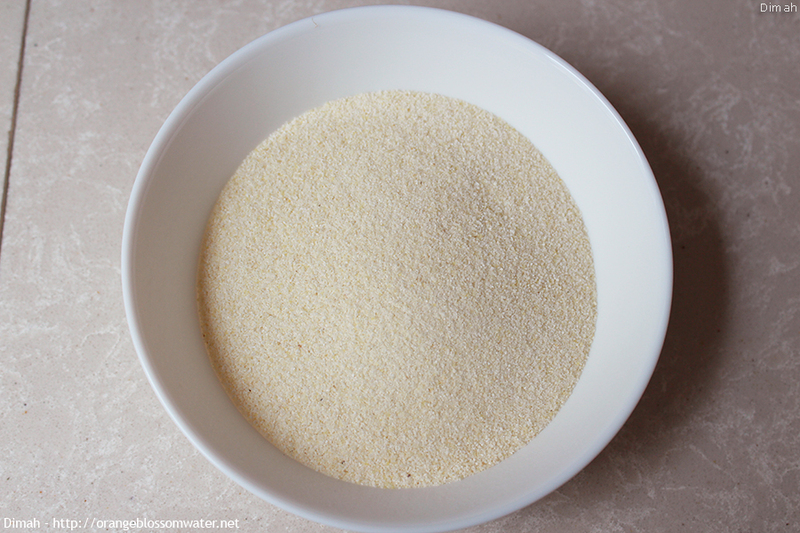 Add semolina flour (smid farkha), and keep over low heat with frequently stirring. 40 minutes after adding semolina flour, add the food coloring, and keep the mixture over low heat with frequently stirring. 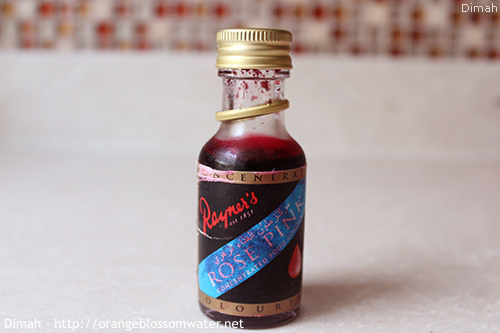 15 minutes after adding the food coloring, add the rose water, and keep the mixture over low heat with frequently stirring. The mixture should be kept over low heat all the time with frequently stirring. The tricky part is to know when the mixture is ready, the semolina flour should be cooked and the mixture will slightly thicken but still runny. 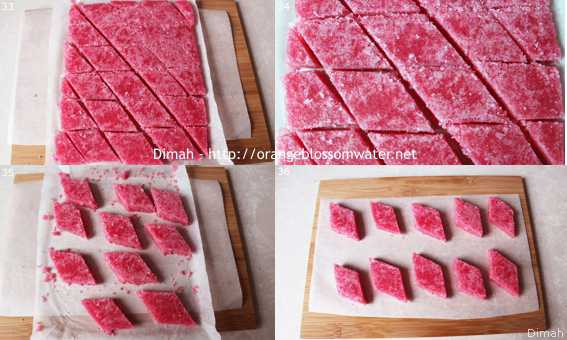 The whole process of cooking Mahia was 100 minutes (from start “step 1” to finish “step 18”). To test if Mahia is ready, drop a spoonful of the mixture onto a plate then wait, it will firm when cools and it shouldn’t stick to your fingers when you touch it. Allow the mixture to sit for 15 minutes to firm up. When the mixture sits you will notice that the surface has sugar crystals, this is normal. Immediately after 15 minutes, transfer into a cutting board. 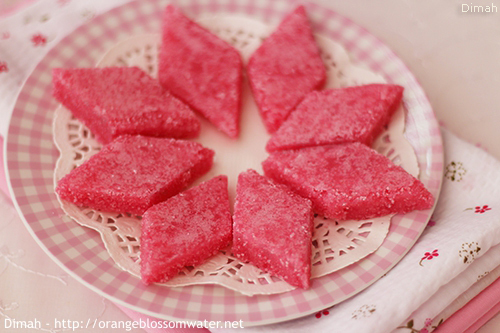 Cut into diamonds, then gently with your hand dust off excess sugar crystals. Store at room temperature for days. If you want to store it for long time so keep it in the refrigerator, but take out of the refrigerator and allow to sit at room temperature before serving. It is really important to use aluminum baking sheet. 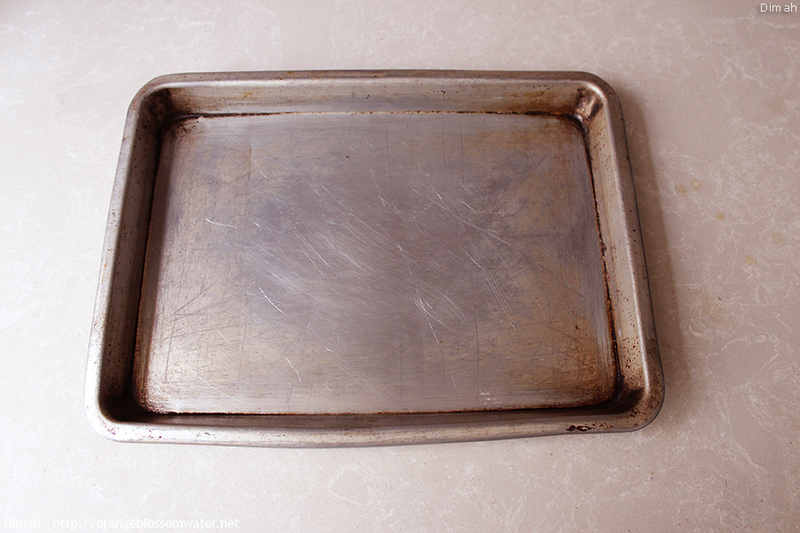 Click here and here for larger photos of the baking sheet and see clearly how to line it. 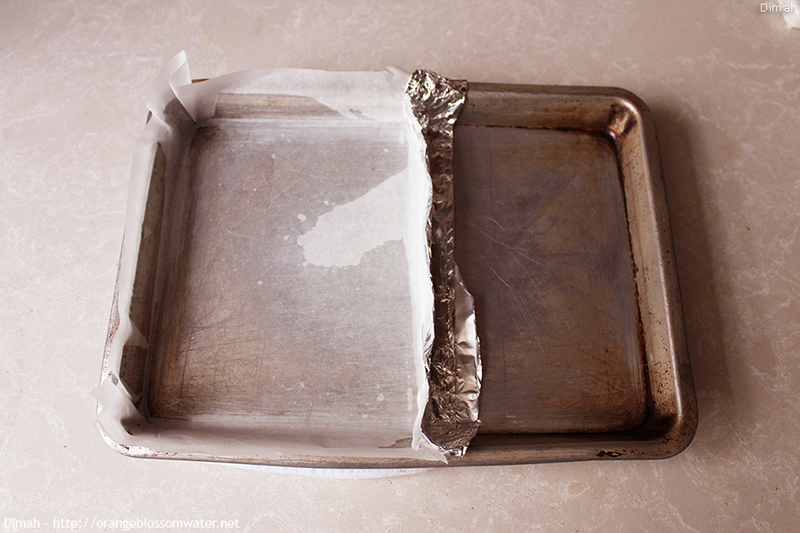 If you have aluminum baking sheet with size 7.9 x 5.9 inch (20 x 15 cm) (base measurement), so line the whole baking sheet with parchment paper and use it for this recipe. 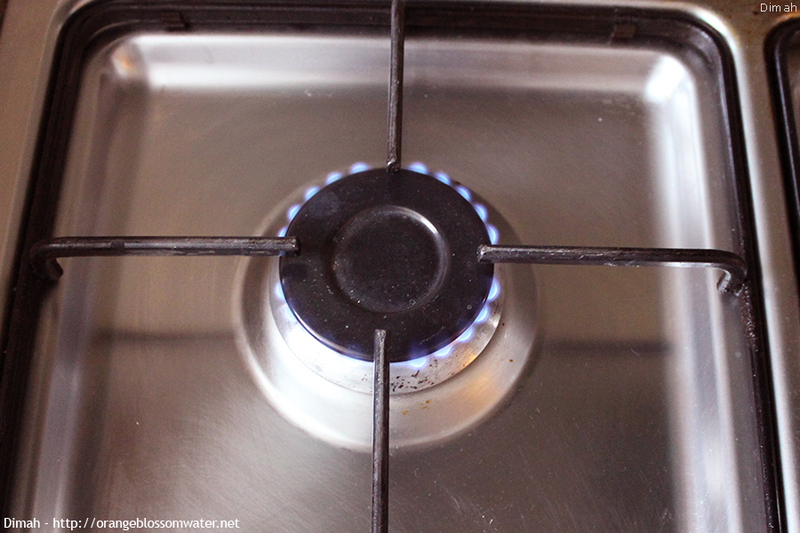 The heat should be low when cooking Mahia, click here and here to see the flame. Semolina flour is called in Arabic “Smid Farkha” or “Tahin Farkha”, it is fine and white in color. For photos of Smid Farkha, click here and here. 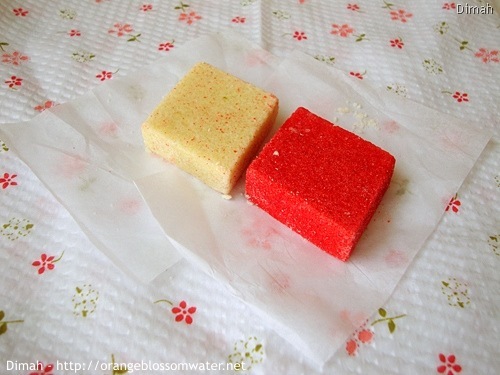 Mahia can be made without food coloring, and in Hama it is always available white (without food coloring) and red (with food coloring as in the recipe), click here to see. 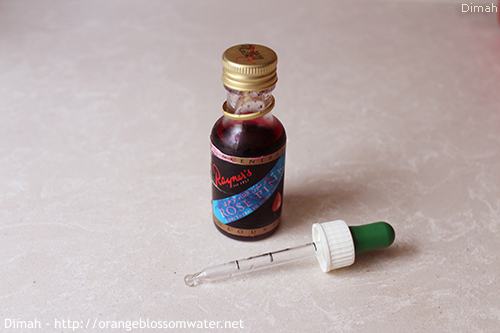 Click here and here to see the liquid food coloring I used. 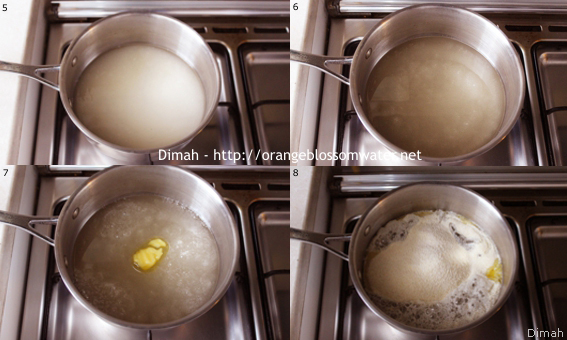 The whole process of cooking Mahia was 100 minutes (from start “step 1” to finish “step 18”). If the mixture didn’t firm within 15 minutes of pouring to baking sheet, so wait for extra 20 minutes, and if still didn’t firm so you have to take it back to saucepan and cook for more time then pour it again. This entry was posted on Saturday, May 28th, 2016 at 8:54 PM	and is filed under Syrian Baking and Desserts. You can follow any responses to this entry through the RSS 2.0 feed. You can skip to the end and leave a response. Pinging is currently not allowed.